I was browsing through Irish recipes sent to my inbox around St. Patrick's Day. 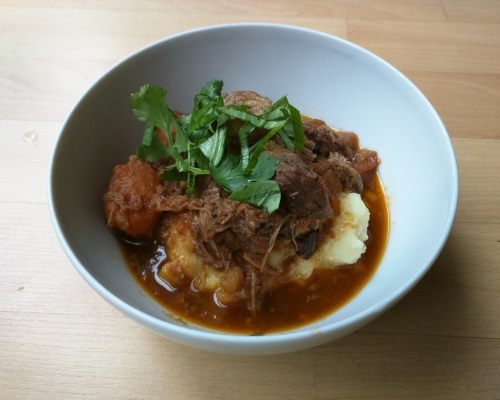 One of the recipes that jumped out at me was Irish Beef Stew over Mashed Potatoes. So I thought why not have my favorite Beef Stew over my favorite mashed potatoes? Vietnamese Beef Stew over Sweet Mustard Mash Potatoes was born. Vietnamese Beef Stew and Sweet Mustard Mash Potatoes have very strong flavors, so feel free to cut back on the mustard if you wish so that the strong flavors of the Beef Stew can stand out a little better. Or substitute with your favorite Mash Potato recipe.